The Town of Ridgeland has a rich history stemming from the Charleston and Savannah Railroad that was completed in the mid 1800s. 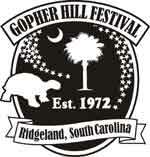 The Town was originally named Gopher Hill due to the "gopher tortoise" which was indigenous to the area at that time. In later days, the name Gopher Hill was not considered suitable for a railroad station and the named was changed to Ridgeland because the Railroad Depot was located on the highest ridge between Charleston and Savannah. The Town incorporated as the result of a petition filed with the South Carolina Secretary of State on October 20, 1900 followed by an election held on November 12, 1900. As a result, the Town was "officially" named Ridgeland with a population of 271 inhabitants. The first Mayor (Intendant at that time) and the first Town Council (Wardens at that time) were elected. Further, the Town limits were established as a circle with a one mile radius starting from a center point where Main Street crosses the Charleston and Savannah Railroad. A subsequent election was held on April 23, 1906 that changed the Town limits to one square mile with the center being the Railroad Depot. The Town limits basically remained the same until the year 2000 and then slowly increased due to several small annexations. Later in this decade the Town started to rapidly grow and several large tracts of land were annexed. As a result, Ridgeland now encompasses approximately 45 square miles which makes us one of the largest municipalities in South Carolina based on our corporate limits. Ridgeland was originally part of Beaufort and Hampton Counties as separated by the railroad until Jasper County was formed in 1912. At that time, Ridgeland became the county seat due to being the population center as well as being near the actual geographic center of the new county. Today Ridgeland is still a small but thriving community in terms of population but, together with Jasper County, we are on the verge of unprecedented growth. Our future is very bright and we look forward to fulfilling our legacy as The High Point of the South Carolina Lowcountry! Thomas Heyward, Jr. (July 28, 1746 – March 6, 1809) was a signer of the UnitedStates Declaration of Independence and of the Articles of Confederation as a representative of South Carolina. He was born in St. Luke's Parish, South Carolina and educated at home, then traveled to England to study law where he was a member of the HonourableSociety of the Middle Temple. He was elected to the Continental Congress in 1775 and signed the Declaration of Independence in 1776. Heyward returned to South Carolina in 1778 to serve as a judge. In command of a militia force, he was taken prisoner by the British during the siege of Charleston. He continued to serve as a judge after the war, retiring from the bench in 1798. Thomas Heyward is entombed near the Old House community in Jasper County just outside Ridgeland. The Battle of Honey Hill was the third battle of Sherman's March to the Sea, fought November 30, 1864, during the American Civil War. It did not involve Major General William T. Sherman's main force, marching from Atlanta, Georgia, to Savannah, but was a failed Union Army expedition under Maj. Gen. John P. Hatch that attempted to cut off the Charleston and Savannah Railroad in support of Sherman's projected arrival in Savannah. Hatch's expeditionary force left Hilton Head, South Carolina, for Boyd’s Neck (above Beaufort) on November 28. It consisted of 5,00 men—two brigades of the Coast Division of the Department of the South, one naval brigade, and portions of three batteries of light artillery. They steamed up the Broad River in transports to cut the Charleston and Savannah Railroad near Pocotaligo. Due to a heavy fog the troops were not disembarked from the transports until late the following afternoon, and Hatch immediately started forward to cut the railroad near Grahamville. The expedition maps and guides proved worthless, however, and Hatch was unable to proceed on the right road until the morning of November 30. At Honey Hill, a few miles from Grahamville, he encountered a Confederate force of regulars and militia, under Col. Charles J. Colcock, with a battery of seven guns across the road. Determined attacks were launched by U.S. Colored Troops (including the 54th Massachusetts), but the position of the Federal force was such that only one section of artillery could be used at a time, and the Confederates were too well entrenched to be dislodged. Fighting kept up until dark when Hatch, realizing the impossibility of successfully attacking or turning the flank of the enemy, withdrew to his transports at Boyd’s Neck, having lost 89 men killed, 629 wounded, and 28 missing. The Confederate casualties amounted to 8 killed and 39 wounded. 1st Lt. O.W. Bennett awarded Medal of Honor.